Join us this week as we examine the various channels and factors to consider in the channel selection process. We examine the pros and cons of using inside sales, direct sales, distribution, e-commerce, franchises and tradeshows. At last week’s Entrepreneurship 101, we welcomed three speakers, Murray McCaig, Volunteer Advisor, Cleantech, MaRS Discovery District; Kevin Smith, The Story Architect; and Christopher Charlesworth, CEO and Co-Founder, HiveWire. 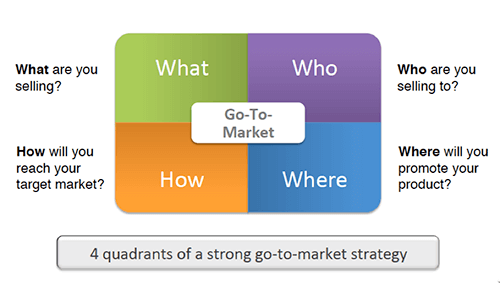 These experts shared their advice on and experience with go-to-market strategies. The lecture covered the importance of a good go-to-market strategy, pricing and crowdfunding. Traditionally, companies focused first on the product, and then on who they would it sell to and how they were going to sell it to them. Marketing and where to promote the product was an afterthought. 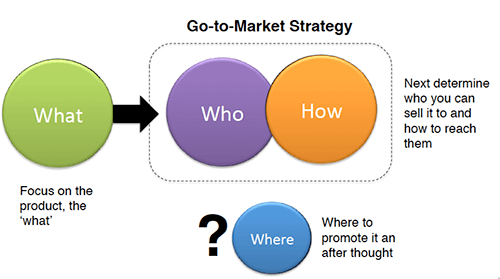 Today, successful companies consider all four of the go-to-market questions as a whole (see the diagram below) and they continuously tweak and evaluate how everything is holding together. An example of a startup successfully using this model is Tesla Motors. Its go-to-market strategy was not to build a car and then go after the environmentalists. The company already knew who its target market was, and it wanted to target a wider audience with its luxury vehicle. Tesla knew the capabilities of its product and spent time on how to sell it because the company knew it wouldn’t be able to sell the car in traditional ways. Now Tesla has stores that sell their cars and you can buy a Tesla online. Kevin Smith highlighted the impact the human brain has on pricing—and that because of this, factor pricing isn’t logical. Kevin used the Apple Watch as an example of a pricing strategy. He explained his theory about the approach Apple used to expand the range of pricing in the market. Kevin contended that Apple wanted to make smart watches a billion-dollar market, but, because the Pebble watch was selling for $200 and setting the market expectation for this kind of price, Apple couldn’t do this. To combat the lower price of its competitor, Apple released a $17K watch. By doing this, it created a status symbol and re-set the market by shifting the expectation of what a high-end watch was. In doing so, by the time it released its $500 watch, the price seemed more reasonable and consumers were willing to spend more than the $200 price that Pebble had set. When you have three prices, say, $200, $500 and $17K, people gravitate to the middle range. This is called anchor pricing. Kevin’s key message was that there is no cookie-cutter way to do pricing. Finding the right price is the same entrepreneurial journey as everything else: you need to make strategic assumptions and do testing. Christopher Charlesworth focused his talk on crowdfunding and the way it’s become a hub for innovation and the first step on the escalator of funding. He discussed the four core types of crowdfunding (donation, reward, equity and lending) and how all four are becoming increasingly available for startups to use as types of campaigns. Charles discussed how crowdfunding provides a way for startups to raise funds for a product that people believe in. What sets it apart is the value startups can create during the course of the campaign. Successful campaigns answer the “what’s in it for me” question when you show you have something to offer. It gives entrepreneurs the chance to go to market with nothing more than an idea and gain feedback from the public. This transparency creates a bond between your company and your customer. With crowdfunding, startups can raise money in 30 to 60 days, as opposed to traditional methods of funding that can take six months to one year. After you’ve delivered on your first campaign, you can come back later on with a second campaign that builds on your first one. 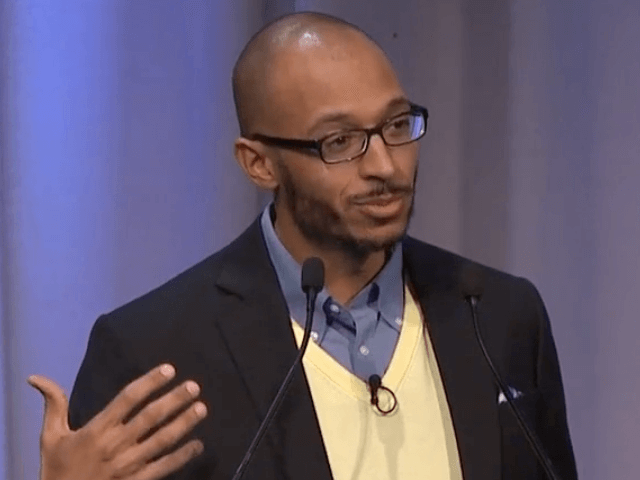 Christopher’s key message to startups was to understand why people are connecting with you and to build on that connection. Once you understand why people have connected—whether it’s emotional, or for tax purposes or a belief in your product—you can develop that relationship.